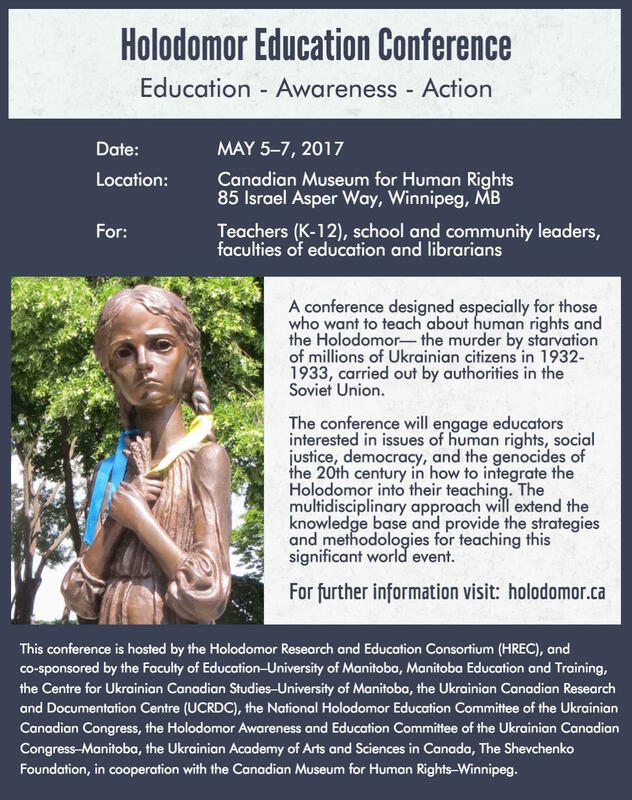 WINNIPEG – Educators from across Canada, the USA and Ukraine assembled in Winnipeg, Manitoba, to attend the second Holodomor Education Conference: “Education–Awareness–Action” (HEC–2017) on May 5-7, 2017, at the Canadian Museum for Human Rights (CMHR). The conference was organized by the Holodomor Research and Education Consortium (HREC), of the Canadian Institute of Ukrainian Studies (CIUS) at the University of Alberta, and held in cooperation with the Canadian Museum for Human Rights. 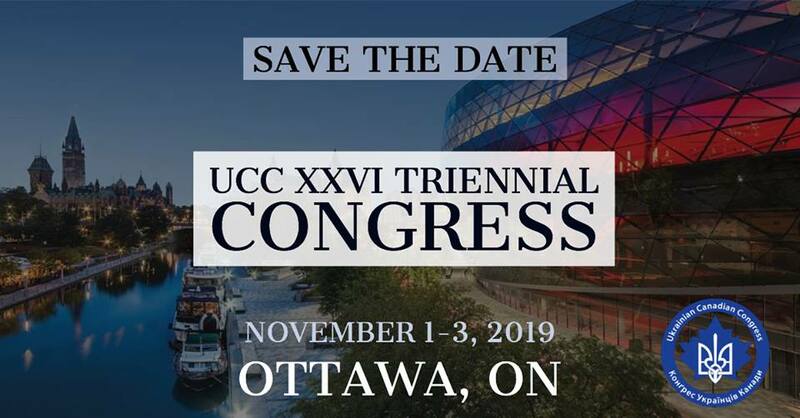 The organizing committee included Valentina Kuryliw, Director of Education (HREC) and committee Chair, Sophia Isajiw and Oksana Levytska of Toronto, Val Noseworthy, Irka Balan, Dr. Orest Cap and Dr. Denis Hlynka of Winnipeg. The HEC–2017 conference brought together 120 education professionals, who teach teach from kindergarten to university. Educators of senior grades made up approximately half of the participants, while the primary and middle years were well represented. Participants shared a desire to learn about new approaches and innovative strategies from 25 conference presenters, speaking on how to teach human rights, social justice and the Holodomor in their classrooms. They were especially grateful for the handouts and suggestions for implementing the teaching of this often forgotten topic in curricula. It was rewarding to observe that many of the participants came from diverse ethnic backgrounds with a strong interest in human rights and genocide. Valentina Kuryliw delivered the opening remarks. John F. Young, the President and CEO of the Canadian Museum for Human Rights welcomed the gathering to the Museum. James Bezan is the Member of Parliament for Selkirk–Interlake–Eastman who introduced in 2008, in the Canadian House of Commons, the Bill recognizing the Holodomor as genocide; he spoke movingly on the reasons for this recognition. Greetings were offered by Mr. Blair Yakimoski, MLA for Transcona representing the Hon. Ian Wishart, Manitoba’s Minister of Education and Training along with Dr. David Mandzuk, Dean of the Faculty of Education at the University of Manitoba. Ontario’s Minister of Education, the Hon. Mitzie Hunter, sent written greetings which were read by Kuryliw. This conference was supported by the Faculties of Education of both the University of Manitoba and the University of Winnipeg. Keynote speaker, Dr. Joyce Apsel, Clinical Professor in the Liberal Studies Program at New York University and President of the Institute for the Study of Genocide, spoke eloquently about “Genocide, Human Rights and the Holodomor: Teaching Human Rights and Wrongs in the Classroom,” and stressed that the Holodomor and human rights need to be relatable and therefore made more personal for students. Dr. Richard Hechter, Acting Department Head of Curriculum, Teaching and Learning, Faculty of Education, University of Manitoba, moderated a very lively and diverse panel discussion on “The Teaching of Human Rights and the Holodomor.” It included presentations by Dr. John R. Wiens, Dean Emeritus and Professor of Educational Administration, Faculty of Education, University of Manitoba, Lise Pinkos, Manager of Education Programs, Canadian Museum for Human Rights, Antonio José Tavares who is the Diversity Education and International Languages Consultant for the Instruction, Curriculum and Assessment Branch of Manitoba Education and Training. Tavares gave an insightful and grounded talk on “Holodomor and Genocide Education with Children of Refugee and War-Affected Backgrounds.” The panel also included Linda Connor, Social Studies Consultant for Manitoba Education and Training and Michael Anthony, who gave a very grounded presentation on “Teaching the Holodomor: Making Best Practices Better.” Anthony is Assistant Curriculum Leader for Canadian and World Studies at Weston Collegiate Institute in the Toronto District School Board. In post-conference remarks he said, “As someone who did not grow up with stories of the Holodomor, but who is teaching the Holodomor to students, this conference was a most important learning experience. I gained valuable information and insight from the many presenters. It has also been amazing to become part of the community of people who are Holodomor and human rights activists and educators in North America.“ Librarian and Holodomor Website Manager and Coordinator of the Holodomor Educators Network in the USA, Lana Babij, rounded out the panel by expertly addressing “The Challenges of Terminology and Resources” on the Holodomor, a very timely topic to educators. The methodology sessions rounded out the conference by providing practical hands-on suggestions for implementing human rights and the Holodomor in school curricula. Natalia Onyschuk shared her expertise at the primary level, showing how song, dance, art and stories can be used to teach a difficult and sensitive topic. Lise Pinkos and Ian Martens showcased the Museum’s new lesson on the Holodomor for the middle years, while Jeff Kozak of Winnipeg presented his best practices in teaching the Holodomor for grades 5-8. Tamara Kowalczyk shared her expertise and experience in teaching the Holodomor within a genocide course at the high school level, and Nadia Prokopchuk and David Katzman shared handouts and information on an innovative new online human rights resource, entitled: “Voices into Action” whose fifth chapter features lessons on the Holodomor. On Sunday, the conference ended with two presentations. The first, by Valentina Kuryliw, emphasized the latest resources and activities on the Holodomor, including websites, DVDs and print materials available for educators and students. The 20-page excerpt she also shared from her soon-to-be published 300-page educator’s manual, Holodomor in Ukraine, the Genocidal Famine 1932-1933: Learning materials for teachers and students was especially helpful because it is chockfull of teaching materials for students, lessons and projects. The second presentation was led by Dr. Orest Cap and Dr. Denis Hlynka of the Faculty of Education at the University of Manitoba and dealt with the problems of finding accurate digital information on the Internet and social media and the use and abuse of such information when studying the Holodomor, social justice and human rights issues. A commemorative dinner was held at the Fort Garry Hotel for 140 participants and dinner guests, who were treated to a dinner and program at which 10 local Manitoba Holodomor survivors presided. Survivor Sonia Kushliak gave a stirring address before a moment of silence was observed. The Most Reverend Metropolitan Lawrence Huculak, Bishop of the Ukrainian Catholic Archeparchy of Winnipeg, and the Very Reverend Alexander Harkavyi, Parish Priest of St. Mary the Protectress Ukrainian Orthodox Cathedral, sang the prayer before the meal and at the closing. The evening’s special guest speaker was renowned academic Dr. Norman Naimark, Robert and Florence McDonnell Professor of East European Studies, Stanford University, who spoke on The Holodomor in the History of Genocide. In his message he stated that the bad news is that genocide has taken place since the beginning of time; the good news is that we are getting better and faster at responding to genocides and that there is still hope for mankind. The HREC Holodomor Education Conference was made possible by the Temerty Foundation and was co-sponsored by The Shevchenko Foundation, Carpathia Credit Union Ltd., Manitoba Education and Training, the Faculty of Education–University of Manitoba, the Faculty of Education–The University of Winnipeg, the Centre for Ukrainian Canadian Studies–University of Manitoba, the Ukrainian Canadian Research and Documentation Centre (UCRDC)–Toronto, the National Holodomor Education Committee of the Ukrainian Canadian Congress, the Holodomor Awareness and Education Committee of the Ukrainian Canadian Congress–Manitoba Branch, the Ukrainian Academy of Arts and Sciences in Canada, St. Mary the Protectress Ukrainian Orthodox Millennium Villa Inc., CanadInns, the League of Ukrainian Canadians and was held in cooperation with the Canadian Museum for Human Rights. 5-7 травня 2017 року в Канадському Музеї Людських Прав у Вінніпезі, пров. Манітоба, відбулася конференції по навчанню Голодомору 2017 на тему «Навчання – Усвідомлення – Дія». Даний форум запрошував до участі широке коло аудиторії – вчителів та адміністраторів шкіл, провідників громад, освітян факультетів вищих навчальних закладів, бібліотекарів. У конференції взяло участь 90 учасників (із канадських провінцій і з США) та 27 доповідачів і ведучих сесій. Конференція спонсорована універитетами Манітоби та Вінніпеґу, Українсько-Канадським Дослідницько-Документальним Центром в Торонто, Національним комітетом навчання Голодомору при Конґресі Українців Канади, Комітетом обізнаності і навчання при КУК, відділ Манітоба, Українською академією мистецтва і науки в Канаді, Шевченківською фундацією у співпраці з Канадським Музеєм Людських Прав в Вінніпезі. Серед запрошених почесних гостей та головних промовців були Д-р Джон Янг, директор Канадського Музею Людських прав; Блер Якімовський, Міністр освіти та навчення Манітоби; Джеймс Безан, член парламенту Манітоби; Д-р Джойс Апсел, директор Інституту по навчанню ґеноциду; викладачі університету Манітоби та Вінніпеґу, Страдфордського університету. Велика робота по організації цього освітнього форуму була проведена директором Консорціуму HREC, головою організаційного комітету Валентиною Курилів та членами комітету. Конференція надала можливість освітянам, які цікавляться проблемами людських прав, соціальної справедливості, демократії та ґеноцидів 20-го століття, ознайомитися з методологіями, ресурсами і технологіями, які допоможуть їм інтегрувати тему Голодомору у навчанні. У програмі конференції проводилися сесії по методиці і підходах навчання Голодомору в класі від молодших класів до старшокласників. На конференції також були представлені засоби використання технологій у навчанні людських прав і Голодомору. Учасники конференції також мали можливість відвідати виставки та зали Канадського Музею Людських прав. Сама назва конференції «Навчання – Усвідомлення – Дія» говорить про мету зібрання. Учасники говорили не лише про важливість цієї теми, а й про те, як поширювати інформацію про трагедію українського народу ХХ століття, як правильно вчити і донести цей матеріал до учнів різного віку. Структура конференції передбачала наукові доповіді, панельну дискусію, практичні сесії, обговорення тематики Голодомору різного характеру. Освітяни збагатилися практичними матеріалами для ведення уроків на цю тему. Вчителі молодших класів відвідали сесію «Підмостки розуміння теми Голодомору учнями молодших класів» (Наталя Онищук, Едмонтон); для вчителів середніх класів була запропонована сесія «Навчання Голодомору в класі середньої школи» (Ліс Пінкос й Джеф Козак, Вінніпеґ); нові е-ресурси про Голодомор освітяни старших класів представила Надя Прокопчук (Саскачеван); Тамара Ковальчик (Торонто) подала методологію навчання Голодомору в контексті курсу про геноциди. Панельна дискусія продовжувала дискусію щодо важливості навчання ґеноциду українського народу у ширшому ракурсі, а саме у поєднанні з темою соціальної справедливості і людських прав. Власне через порівняння та глибокий аналіз студенти зможуть якнайбільше зрозуміти цю сторінку в історії не лише України, а й усього людства, рівно ж висловлювати і вміти відстоювати свою точку зору та брати участь в поширенні обізнаності цих історичних подій. Методики, засоби, ресурси, представлені на конференції, дають можливість також освітянам канадських шкіл в англомовному середовищі навчати про Голодомор як частину курсу історії та соціальних наук в різних провінціях Канади та поза її межами. Напрямок дії для освітян і громади сьогодні – це дія поширення навчання про Голодомор і поширення обізнаності про нього для теперішніх та майбутніх поколінь.